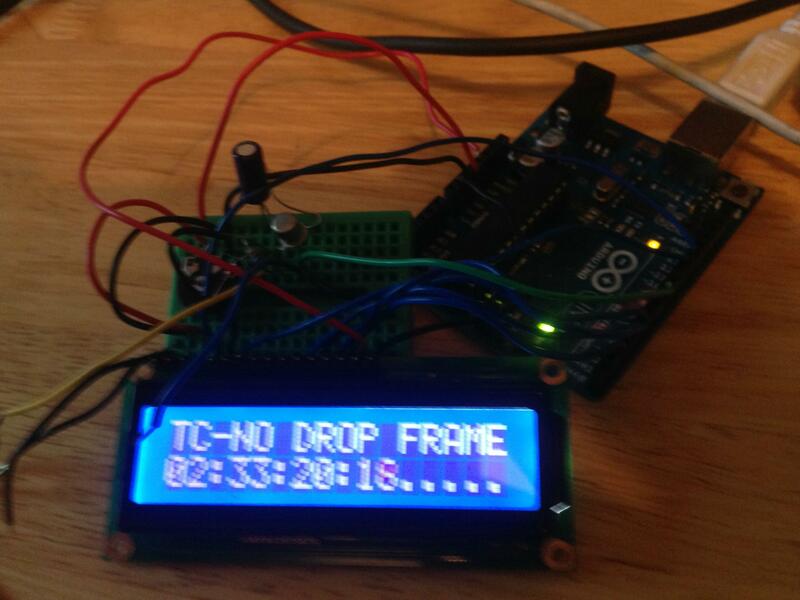 I've managed to adapt some code from the Arduino forums to display timecode on an LCD display. What I would like some extra help with is first is there a way of defining the one_time_max etc differently depending on the high low state of a pin? This way I could use a switch to change the times so it could switch between NTSC and PAL. Secondly would anyone be kind enough to explain what is happening in the middle part of this code? I've made some notes but any help would be really appreciated. // It's the durstion of a one and zero with a little bit of room for error. //toggles the edge that triggers the handler so that the duration of both high and low pulses is measured. //detects whether theree is the drop frame bit. The one_time_max, one_time_min, zero_time_max and zero_time_min are all defines at the top of the file. This will insert them as constant values at compile time. This makes changing the code to deal with them slightly awkward, but not impossible. change one_time_max to ONE_TIME_MAX_NTSC and ONE_TIME_MAX_PAL so that you have two defined constants for each part. Caps is convention for defines. create a new global variable, a boolean, that is a flag to decide if PAL or NTSC is to be decoded. every time that one of the constant is used, use a conditional statement based on the global variable to decided which constants are used. use the input from a button to decided the value of the global variable. I am in the process of implementing exactly the same thing. The simplest way around this problem is simply to do away with the one_time_max and one_time_min variables and simply implement a mid_point value, testing the bit_time against this for one and zero values. By simply testing for a mid_point value, it allows the routine to tune itself for integer/non-integer timecode values from 24fps thorough to 30fps. Not the answer you're looking for? Browse other questions tagged arduino-uno lcd or ask your own question.